Do you want to organize a welcome dinner/lunch for your party upon your arrival? We are available for cooking classes at your vacation accommodation in Umbria and southern Tuscany (Arezzo, Siena, Cortona). 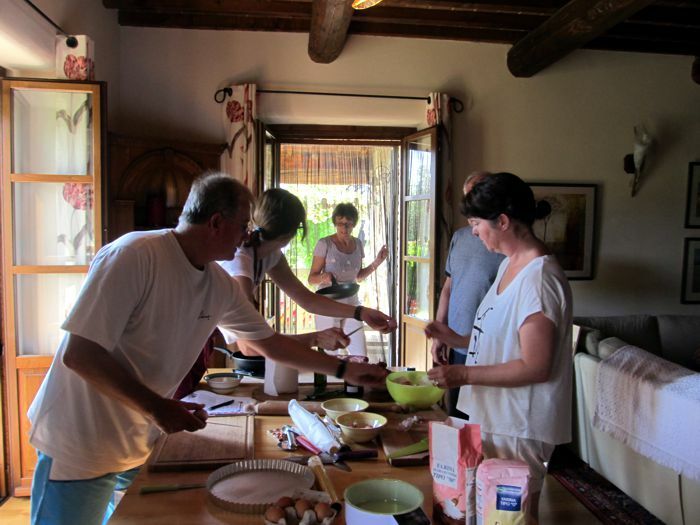 Traditional and innovative meals prepared for groups of 4 to 20 staying in the Umbria and Tuscany territory. We will come into your rental Villa and stay with you for showing and teaching you the secrets of some tasty Italian dishes. We provide the material and the ingredients for the cooking class. During every lesson we explore a complete menu; you’ll get in touch with the techniques and the traditions of the Umbrian cookery, which is one of the best in Italy and contributes to make this region so special. Recipes vary according to the time of the year, since we only use the freshest ingredients available. Lessons consist of a 4 hour session during which we’ll prepare a delectable 5 course lunch or dinner. 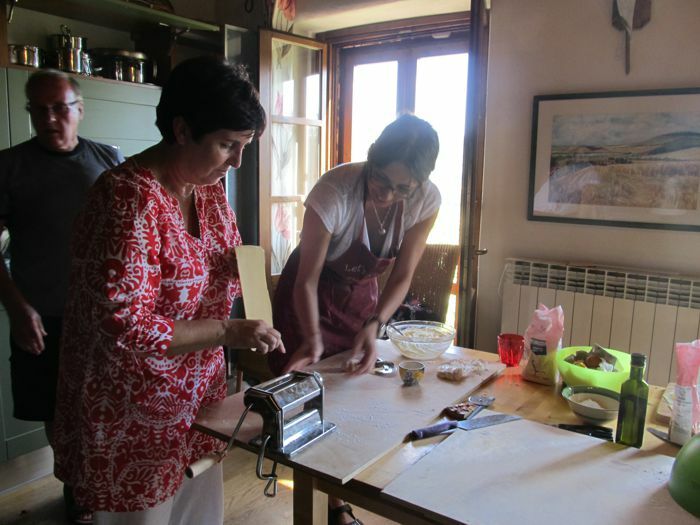 On our first trip to Umbria, we arranged for Let’s Cook in Umbria to come to our villa to provide a three-hour cooking lesson for seven people. It was everything and more than we expected. Raffa and Stefania showed up on time (a little early, actually!) fully equipped and ready to go. Raffa had tailored the menu exactly to our preferences (avoiding a few ingredients and focusing mainly on typical Umbrian food), and Stefania was a skilled and excellent teacher. It was more than just a casual demonstration–we really learned a lot. Raffa’s homemade cherry preserves. When we finished our cooking, Raffa and Stefania served us what we’d prepared, and left us to enjoy one of the best meals we had during our time in Italy. In addition, the price was very reasonable, especially considering the time, effort, and food provided by Raffa and Stefania. I’d recommend Let’s Cook in Umbria without any reservation whatsoever. You’ll have a fun, memorable, and delicious experience.